It is a common error of reasoning, this false concept that to love one’s country means to love one’s government. Republicans have deployed the “to criticize us is to be unpatriotic” rhetoric effectively over the years, although notably taking a timeout during Obama’s presidency. During those eight years, it suddenly became patriotic to criticize the president. In fact, there is nothing more American than to criticize the president, and the government at large, no matter which party is currently at the helm. Many may be feeling less than peak patriotic this Fourth of July, what with our mean-tweeting, probable Russia-colluding president sitting in the Oval Office as our angry faced leader. But America isn’t Donald Trump. America isn’t Republican, nor Democratic, nor even Independent. The American political system delivered us Trump, allowing for a rollback of civil rights, banning travel from Muslim majority countries, pulling out of the Paris Accords, proposing the defunding of HIV/AIDS research, and an all out attack on the free press. All of this is an assault on the very principles that give us real reason to be proud Americans. But the American people voted against Trump, no matter how many lies he tells about millions of fake votes. And his popularity isn’t exactly growing, while at just the start of the Russia investigations. 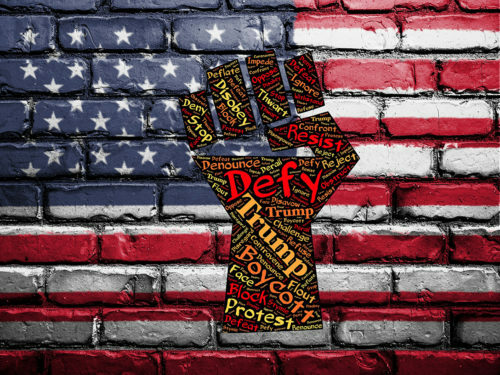 Take pride in the growing backlash, take pride in the people gathering out in the streets, demanding we stop these attacks on our American values in the name of Trumpism. Take pride in a history of revolution, in the civil rights movement, in the fight to end the HIV/AIDS epidemic. Remember that dissidents are so often derided and smeared before being elevated and celebrated, and that there is a lot of work left. Remember that this is still your country too, and that you can still get out in the streets, and you can still get on the phone with your elected representatives, and you can still run for office. If you don’t like where this country is headed, you can still play a part, however small, in helping to change that course. That is what makes America great. And we can be greater still, again. Keep resisting. This is still your America too. Happy 4th.